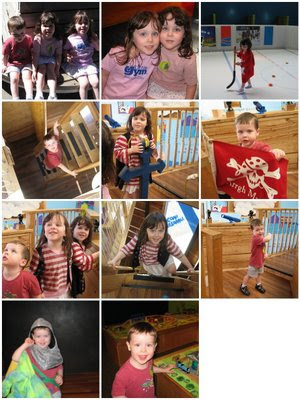 The kids had a lot of fun playing dress-up and performing on stage, playing pirate on the pirate ship, and "sock-skating" around the mini Carolina Hurricanes hockey rink. Last week, my son turned 3. 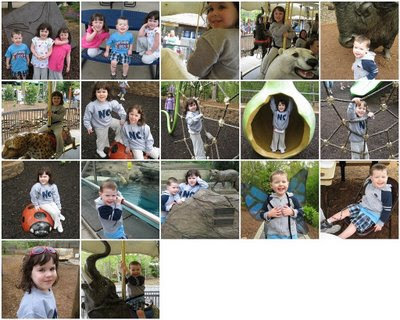 In lieu of a party, we decided to spend a family day at the North Carolina Zoo in Asheboro. I hope this is a good preview of a fun summer ahead! After receiving all of the donated blocks from around the world, Victoria assembled a beautiful quilt that she so appropriately named "Nothing But Kisses". 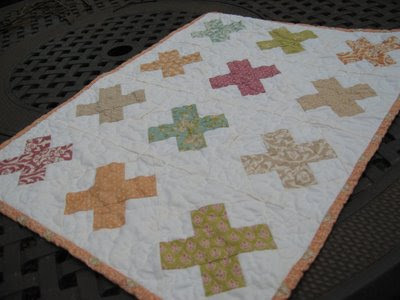 The auction for the quilt has just recently opened. 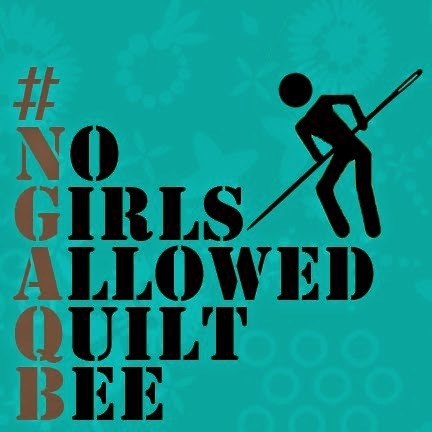 Please click here for the official auction site for the quilt and consider making a bid if you are in the position to do so. I know I will. Wouldn't this be an amazing gift for someone ... or for oneself? I've been reading (quite sympathetically) over the past few months about the mutant stomach bugs that have been making their way through so many of your homes. 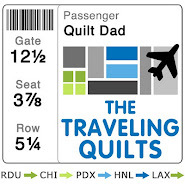 Well, it seems that we here in the Quilt Dad household are not immune. My son brought one home from school last Friday and it's been making its way around all week ... leaving a wake of cancelled birthday parties and missed deadlines in its path. Mrs. Quilt Dad and I have been tag-teaming childcare duties, and I'm home with my son (who hasn't been able to kick it yet) today. 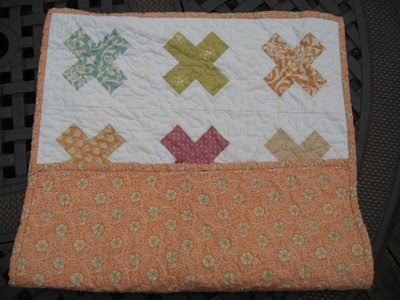 Anyhow, I thought it would be good time to post about one of my recent mini quilt swaps. In March, the Swap 'Til You Drop group traded mini quilts with a Japanese theme. Here is the awesome loot I received from Andrea (aka quiltedoma). How cool is this? It's a double-sided quilt! On one side is a coin-like design with beautiful Asian fabrics. And on the other side is a really creative design featuring an origami crane. I'm always looking for creative label ideas, and Andrea's is truly original. Because the quilt is double-sided, she created a dangling tag featuring all of the quilt info! Now it can hang on either side. I love this quilt so much -- thanks again, Andrea! When I found out it was a Japanese-themed swap, I of course turned to my trusty Japanese Block book. I decided to create a small Japanese block sampler, and pulled a palette of brown, pink and cream fabrics from Amy Butler's Midwest Modern line. This pictures gives a little bit of a better view of the four blocks. 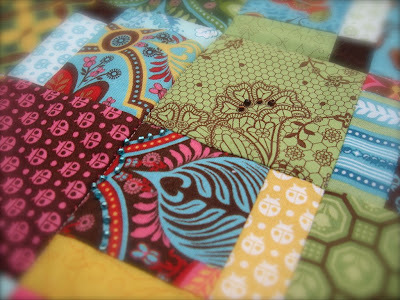 I really enjoyed making this quilt, but in retrospect wonder if I should have stuck with solids or smaller prints. I think some of the design gets lost because of the large prints on some of the fabrics I used. As always, I had a great swap experience. For those of you who have been asking me in the comments about how to get involved in swaps, I encourage you to come over to Flickr and jump in to the many active swaps happening over there! 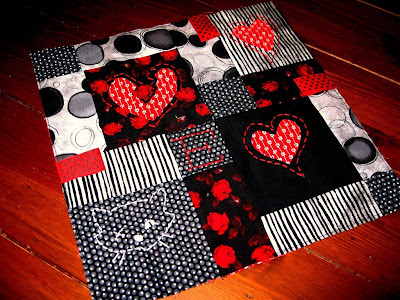 I am excited to be taking part in Amy's Bloggers Quilt Festival today! For those of us who aren't fortunate enough (yet? : ) to go to the big quilt festivals, this is a fantastic way to browse a virtual gallery of the quilts that bloggers have chosen to showcase. Be sure to visit Park City Girl to view the full list of participating bloggers ... especially because there are some great giveaways happening, too! OK, so for those of you who read my blog regularly, you may have noticed that I am a bit of a swap junkie. Actually, I know you've noticed, because you've told me so in my comments!! Well there are several reasons why I enjoy swapping so much. First, for a relatively new quilter, it has been the best possible way to practice, practice, practice. Seam allowances, matching points, pinning & pressing ... you name it. Swaps have provided me with a crash course in block-making. 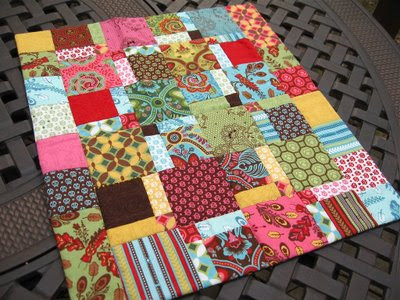 Second, it has enabled me to participate in the vibrant, colorful, supportive, and fun community of online quilters. I have met so many fabulous people that I never would have met otherwise. And to be able to share my passion with like-minded people is priceless. Finally, it has allowed me to help fulfull other people's visions for their creations and put my stamp on a little piece of other people's lives around the world. Being able to play with new fabrics and try new techniques to stretch myself has been nothing short of a BLAST. 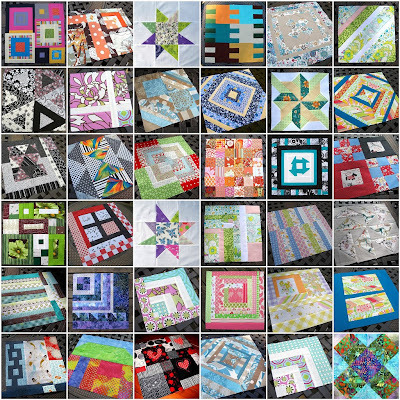 So for my favorite quilt, I have chosen to display a virtual quilt made up of some of my favorite blocks that I've made that are now featured in other people's quilts around the world. 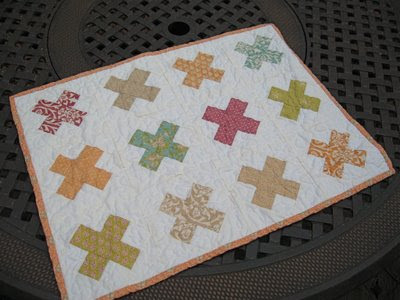 (A virtual quilt is quite fitting for a virtual quilt festival, no?) Besides, all of this swapping has left me little time to complete anything of my own! Many thanks to all of you with whom I am taking this journey for your inspiration, your encouragement, your help, and your friendship. April has been a great month so far in the many quilting bees to which I belong. For example, check out the fabrics that Marilyn selected over in the SewConnected 2 group. She's making a quilt for her soon-to-be-born grandson ... but since the quilt will be living at her house, she wanted something that she could enjoy, too! I was really blown away (in the best possible way) by the selection, which included prints from Amy Butler and Anna Maria Horner that worked together beautifully. Marilyn gave us the choice of making either 6" or 12" blocks, which I think will make for a very dynamic and interesting quilt. I decided to go small this time and ... well, once I got started, I couldn't stop. The simple one in the top center is my favorite. 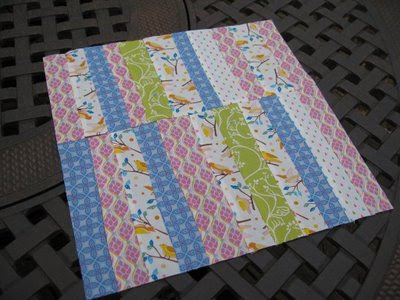 And in the Cottage Quilting Bee, Katie from Metrosupial Designs sent out a color-coordinated scrap package to everyone in the group and asked for a basic block of 36 2.5" squares. I got my favorite color to work with -- orange -- and had a lot of fun fussy-cutting each and every square to feature something interesting. Another grand, spectacular quilt in the making, I think! Finally (and also from the Cottage Quilting Bee), my favorite British monkey sent out a charming selection of bird-themed fabrics ... but really, would you expect anything less than fabulous from Katy?? I went totally improv on this one, shooting for a "hop, skip, & a jump" look a la Denyse Schmidt. 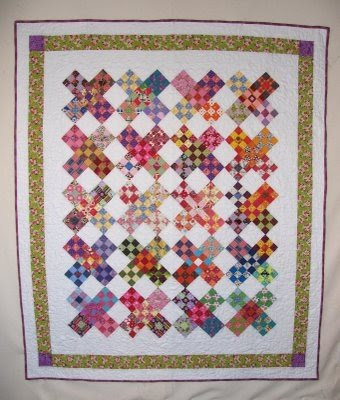 (Sorry for linking to your post, Kathy, but it's really the greatest example of the full quilt that I could find! Hope you don't mind ...) I pulled some coordinating Full Moon Forest from my collection to give the block some contrast. I hope she likes it! People are strange ... especially Emily! Thanks for sticking with me, folks! I know I'm way behind on my blogging -- I've got 2 or 3 blog posts already started and in draft mode, and another 2 or 3 in my head -- so I am going to try my best to catch up. Let me share with you a block I made a couple of weeks back for the Cottage Quilting Bee. 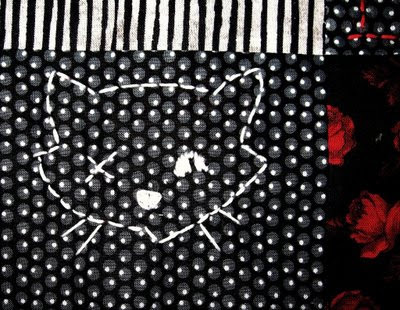 Viv sent out a selection of black, white and red fabrics with an unusual request: create a quilt block in the spirit of a fictional character named Emily the Strange. I had never heard of Emily before, but Viv and her daughter are big fans and wanted a quilt in her honor. First, I have been somewhat obsessed with trying a reverse applique technique a la the Alabama Stitch Book. 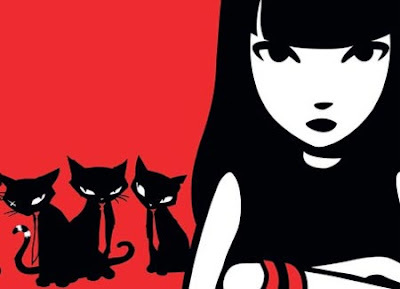 Have you guys checked out this book? Made any projects from it? 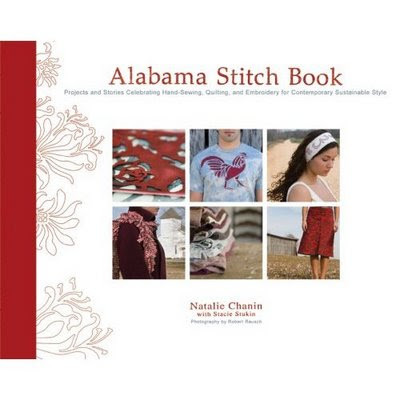 I don't own it (yet), but have browsed it in Barnes & Noble many times. 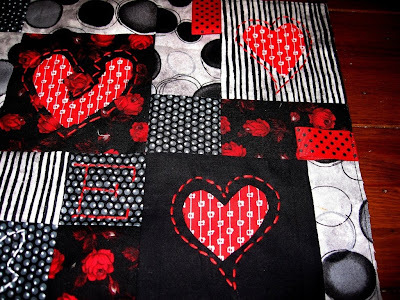 Viv asked for hearts, so I figured I would overlay a black and white quilt block over a cut of red fabric, and reverse applique some hearts. I made a simple disappearing 9-patch block so that I would have a couple of large "frames" to work with. Mind you, this is the first time I've ever exposed any handwork (handiwork? what's the right word here?) to the world. And once I started, I didn't stop! See Emily's initial in the small square above? Can I brag on myself a little here? I didn't have a chalk pencil or anything to sketch Miles out on the black fabric first, so I tackled this freehand. Pretty brave, eh? ... especially since I was working with someone else's fabric! Not too shabby, I think ... apart from the slight misstep on his chin. Oh well, it gives him some character! Here's the final block all put together. As you can see, I also added a few ribbon tags that should wedge themselves in the seam allowance when the quilt is assembled. Wow, I really can't wait to see how this one turns out. 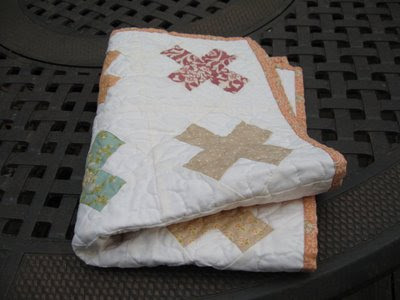 Follow along in the Cottage Quilting Bee pool! I'm not sure how much I've mentioned here on my blog before, but we in the Quilt Dad household are huge UNC Tar Heel fans. Between Mrs. Quilt Dad and myself, we hold FOUR Carolina degrees ... with a possible fifth in our future (hers, not mine). No sooner had I started celebrating the Tar Heels' win over Villanova last night than I started getting some smack talk comments on my blog ... specifically from a Ms. KateKwiltz in Chicago. A Michigan native, Kate has deluded herself into thinking that the Spartans might actually have a chance tonight. She's so confident in her team, in fact, that she challenged me to a friendly wager: 4 fat quarters to the winning team's fan. And we all know who that's going to be. Boy, I can't wait to add to my stash! So if you're not sure who to root for in tonight's game, consider cheering for Quilt Dad over KateKwiltz in the Quilting Smackdown 2009! 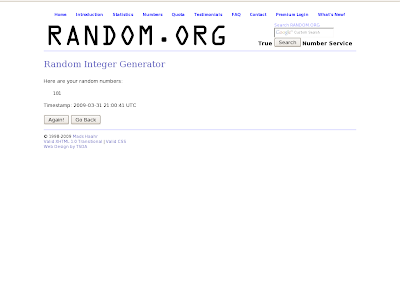 And really, how fitting is it that Ryan would win a giveaway that was originally brought on by a Tribute to Male Quilters? It just feels right. So Ryan, leave me a comment or shoot me an email and I'll get these pillows off to you right away!